German Chancellor Angela Merkel met with Poland's President Lech Kaczynski on Friday to try to persuade him to drop his threat to veto a reform treaty meant to set down a new rulebook for the European Union. On the second day of the bloc's summit, Poland and Britain continued to strongly oppose efforts by summit host Merkel to get all 27 EU leaders to agree to redraft the bloc's unsuccessful constitution and replace it with a new treaty. 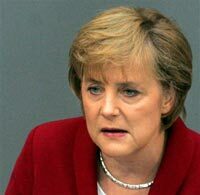 "We shall continue to work hard on all of the problems that have not been solved yet," Merkel said. "But each and everyone is trying his or her level best." Merkel also was to hold bilateral talks with British Prime Minister Tony Blair and the leaders of the Netherlands and the Czech Republic in an effort to bridge deep divisions. Officials said little progress was made in late-night talks Thursday. Blair insists on retaining Britain's right to determine its own policing and anti-crime policies as well as labor laws, and that London keep control over foreign policy matters - "red lines" Prime Minister Tony Blair said must be respected. Poland is adamant that a proposed voting system - which it says favors bigger countries - be changed to give it more power in the bloc. "The situation is really difficult, but we will negotiate until the very end. It's not Poland's habit to give up," Kaczynski said early Friday. Merkel, determined to close out her country's EU presidency with a deal on a treaty she says is crucial for governing the expanded EU, said she would aim to get all leaders around the table after her bilateral talks later Friday afternoon. French President Nicolas Sarkozy said all 27 leaders agreed Thursday on the need for quick agreement on a treaty. He and Merkel met separately after dinner with Kaczynski, who Sarkozy said took "a hard line" on the proposed EU voting system, which Poland fears will diminish its voting clout. Under the so-called "double majority" voting system, EU legislation and other measures would be adopted if at least 55 percent of the 27 EU nations say "yes," and they represent at least 65 percent of the EU population. Poland was weighing two other proposals modifying these rules, diplomats said. "None of the proposals put forward to us is entirely new. We're analyzing them all; there are some from which all countries could benefit equally," said Polish Foreign Minister Anna Fotyga. Kaczynski told the leaders one possibility was to negotiate the voting system in a separate EU meeting later, Czech Prime Minister Mirek Topolanek said. That suggestion, however, did not go down well with the other leaders. Poland brought nearly two dozen legal experts and mathematicians to the summit to analyze various possible voting systems, diplomats said. In the weeks running up to the summit, diplomats have haggled over such things as the role the EU flag - a circle of 12 golden stars on a blue background - and Beethoven's "Ode to Joy" as the EU anthem. Neither will make into the new treaty even though it will have little impact on their current status. Some countries said enshrining the symbols reeked too much of a European superstate. The leaders also discussed the ability of national parliaments to raise objections in drafting of EU legislation; the position of an EU president who would be chosen by EU leaders for a five-year term to chair EU summits, and the EU's common foreign affairs representative; and conferring some EU powers back to national governments.